Enjoy three tender romances in this Bling! Romance box set. After a tragedy involving a football player destroys her family, athletic trainer and graduate student, Cassie moves across the country looking for a fresh start. But a sudden change in her financial aid package lands Cassie in the middle of a cash-crunch nightmare. When Reed, a rookie football coach, offers to help, she thinks her problems are solved. But as injuries and losses pile up, Reed's dreams seem to be slipping away. 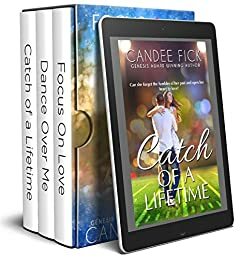 Now, in order to salvage the season, Reed must choose between the game he loves and the woman who just may be ... the catch of a lifetime. Danielle Lefontaine, a fledgling actress, has her sights set on Broadway. But when a jealous cast member threatens to drop the curtain on her dreams, Danielle fears her one brilliant moment in the spotlight is about to become a dim memory. Alex Sheridan is living his dream — playing the trumpet and helping run his family's dinner theater. When "Dani" dances into his life, Alex is sure he's found the perfect partner — if only the bright lights of a bigger stage don't lure her away first.